Nothing about Linling Lu’s tragically pretty paintings at Hemphill Fine Arts will be lost on Washington audiences. In painting targets and shaped canvases, she appears to channel Kenneth Noland, a darling of the 1970s Washington Color School whose work can be seen regularly in D.C.’s museums. Washington has for too long grappled with the legacy of the city’s brief moment in the art world’s spotlight; why shouldn’t a recently arrived painter from Guizhou Province, China? Don’t over-read the circles and chevrons in Lu’s paintings. 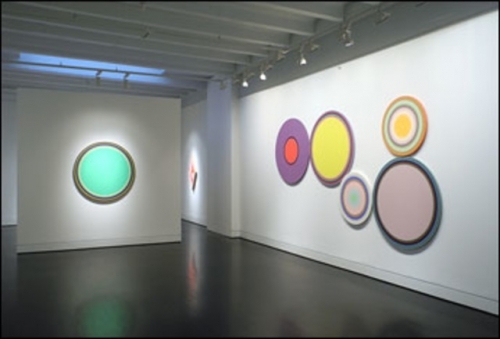 While any painter from the States who decided on abstract paintings of concentric circles on circle-shaped canvas would be quoting Noland—who pioneered the shaped canvas and many of the discoveries it afforded within the Color Field school of abstract experimentation—Lu isn’t winking in Noland’s direction. She’s embracing a mold, not breaking it, and for totally different purposes. Take Lu’s targets. Her circular paintings, which hail from a series called “One Hundred Melodies of Solitude,” pledge allegiance to a violet palette. (The title of the solo show, the artist’s first with Hemphill, is “Lilac.”) Some of these paintings are dreadfully tonally accurate, especially the four that make up “Installation IV: Lunar Paeonia 2.” (The paintings are created and titled individually, but shown in clusters that get their own name.) These could be Pantone studies, a risk-free assemblage of cream, peach, lilac, chamomile, putty, lime, tulip, and rose—colors that exude softness and sweetness. This isn’t the color theory devised by Josef Albers at Black Mountain College, where Noland and so many other Ab-Ex stars studied. But Lu’s findings confirm some of Albers’ core ideas. The four circular paintings of the “Installation IV” group may be plain, but they play off one another exceedingly well. Whereas Noland used the color and the shape of his canvases to address the space around and between painting and viewer, Lu’s paintings are more insular—they carry on a conversation between themselves. Sometimes it comes down to an optic effect: Move between the citrus flair of “One Hundred Melodies of Solitude No. 24” and the Easter purples of the rings of “No. 23,” and the latter painting appears to lose all color, becoming rings of old-television-black-and-white halftone. Optic games aside, the paintings are still too pretty. Pretty is not a flaw, not a bad mark—here, it’s just a sign of balance without any contradictory statements or off-kilter experiments. Fortunately, Lu has included a series of chevron paintings, which aren’t really paintings at all but rather collages of found fabrics from home and abroad. “A Piece of Red Cloth No. 1” is a diamond-shaped stretcher that features a flare of pink and fuchsia swatches. Here, she’s inadvertently quoting again—this time, from Lee Krasner, who used abstract-expressionist figures the way that Lu uses abstract-expressionist patterns. Borrowing is always welcome in painting, and it may be the only strategy left. Lu takes very common tropes in painting and tries to accomplish different things with them—but she isn’t yet risking enough to get the most of a bold approach.